Located in Benidorm's Levante Area, the Torremar Aparthotel is a popular choice for families or groups of friends. Just 300 metres from the lively nightlife and shops of Levante New Town and the beach. We are writing this review basically to warn people holidays 2005. This is having just received notification of building work being carried out @ hotel Torremar this is the rear of Ambassador Playa I & II (Thomson fact file 6/5/05)involving construction of a basement (underground) car park. Once completed a swimming pool with a terrace area will be built on the ground above car park. We arrived at the hotel, our first holiday aboard to Spain as a family. The reception area was presentable, the staff were very friendly and helpful as were the Thompson reps. There are 20 levels here, we were on the 12th floor, the apartment was very bright and clean, the kitchen was well equiped, but very small, this did not bother us as we went out for all our meals. The bathroom was perfect for a young family, shower with a bath, and loads of clean white towels that lasted us our stay. The bedrooms were again well presented, we had patio doors in the main bedroom leading to the balcony, as there was also a door to the balcony leading to the balcony from the main living area, we were very comfortable there. Apartment was run down and shabby. I would only rate it as 2 star. Saying that I could not fault anything else about our 1 week stay. Maid service 3 times in one week. No noise from other guests and staff were helpful. We stayed in a 2 bedroom apartment and were situated at the end on the third floor. I found the curtains, bedspreads, towels and tea towels to be clean. The sofas were clean, but the material is looking faded. The sofas in the reception area do need replacing. The cooker in the kitchen in the apartment we stayed in could do with replacing. The outside of the windows were dusty, but this is due to the work that has been done in that area. There was no dust on the balcony floor. The Torremar is closing for refurbishment. Just got back from a week at the Torremar in Benidorm with 3 mates and have to say that for the price we paid the accommodation was perfect. The hotel was clean, location was excellent and they gave us a room on the 19th floor (high up as requested) as there were road works taking place whilst we were there. The only bad point was that we had 4 lads staying in a 1 bedroom appartment so although we had 2 sofa beds it was a bit crazy for space for hanging clothes up etc etc. All in all a great place to stay though and I would defo go back again. Special mention to Gail the Thomson rep as well, what a helpful babe! Went to this apartment in august with 4 friends ( we are all 18!A very very good apartment except for having to catch the bloomin lift to floor 19-how slow!! the pool and the bar were both loverly, as was Gail our rep!. The onyl downside is the maid, who wasnt very nice..but saying that we did make a mess!!! 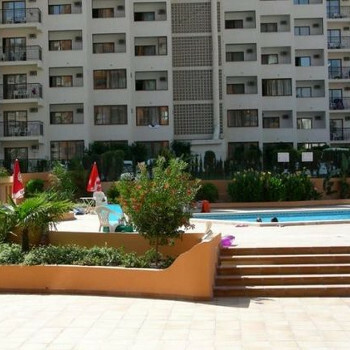 We thought these apartments were ideal for us as a group of young adults, it was clean, the location is just round the corner from all the nightlife. We never really saw much of the staff or the entertainment cos we went out every night, but the entertainment was ok for families. The pool was great and clean. The only downside was the lifts which were so slow! and there was roadworks right outside as well. We didn't have air con either which was a total nightmare for the girls when getting ready. Went with a group of 10 girls and have already booked to go back again in september which shows how much we rate the hotel! Food in the restaurant was so nice and so cheap hardly used the self catering services seen as we ate in there most of the time. Ideal location for all the clubs and bars which were practically on the door step yet the noise at night wasnt too bad. Hotel staff were great really friendly and we all got on with all the bar staff, entertainment was as good as it needed to be and we always made it down to happy hour so saw it every night! The hotel was great. We loved it so much that we are going back again. We couldn't say a bad word about it, the hotel staff were excellent (especially the bar staff, with speacial mentions to Santi, Dani, Miguel and Floren). The reception staff were also very helpful, especially when our friend was admitted to hospital. The only bad thing about the hotel was the absense of the reps. We found that when we needed them the most they were nowhere to be seen. I would recommend anyone goes to this hotel. Even if it is just to go to happy hour. Hi my name is Natassha. This hotel was great! About 5 minures walk away from the main bars and local eating out places. The staff were very friendly especially the waiters named Dani, Santi, Miguel, Nacho, Simeon and Paco. The receptionists were very friendly too. The reps were helpful although sometimes they was never anyone there at all. It was quite clean and the rooms were very spacious. The pool was big and the noise of the outside was not a problem. I would definitley stay there again! And so would my family.